This sourcebook offers all the information you need to understand and design biomedical instruments. Biomedical Instruments contains extensive analysis of signal processing electronic design for medical instruments, in-depth descriptions of design methods for medical transducers, and an introduction to medical imaging and tomographic algorithms. Transducers covered include variable R, L, and C, piezoelectric, electrodynamic and magnetostrictive, force balance, and fiber optic. Operational amplifiers, analog filters, biotelemetry, discriminators, phase-locked loops, and microprocessors are covered in a comprehensive section on circuitry. Exercises and problems accompany each chapter of the text. 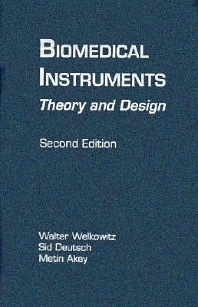 This is the first paragraph of the preface...either the paragraph above, or this paragraph can be used for the blurb_ From the Preface: The book aims at (a) presenting a physical explanation for the behavior of various transducer, (b) developing the mathematical theory applicable to these transducers, and (c) discussing the practical design of biomedical instruments. Our hope is that the book will serve as a text for biomedical engineering students who will be engaged in the design of instruments, as a reference book for medical instrument designers, and as a source of ideas for the large numbers of biomedical research workers who, at one time or another, must build a gadget to implement their research. Numerous examples of medical instrument design are presented in order to clarify the mathematical analyses. Biomedical engineers, research workers, and seniors and graduate students in electronics engineering. Transducers: Analytical Methods. Passive Transducers. Piezoelectric Transducers. Ultrasonic Instruments. Electrodynamic and Magnetostrictive Transducers. Force Balance Transducers. Fiber-Optic Transducers. Signal Processing Circuitry and Microprocessors: Operational Amplifiers. Analog Filters. Data Acquisition Circuitry, A/D Converters, and Microprocessors. Biotelemetry. Frequency Discriminators and Phase-Locked Loops. Medical Imaging: Tomographic Imaging Techniques. Index. Rutgers University, Piscataway, New Jersey and University of Medicine and Dentistry of New Jersey, Robert Wood Johnson Medical School, New Brunswick, U.S.A. The key element for acquiring the physiological signal in biomedical instruments--that is, vital signs or other biomedical measurements--is a well designed transducer. The underlying theory and operational principles for many of the transducers in use in modern biomedical instruments are detailed in Part One. Once the physiological data has been appropriately acquired, signal conditioning techniques are applied in modern instruments to convert the information to a form ready for use by equipment operators or computer interface. Part Two clearly presents most of the techniques utilized by current biomedical equipment designers.